The School of Education at the University of California, Irvine, in partnership with Garden Grove Unified School District (GGUSD), has been awarded a $3.5 million grant from the U.S. Department of Education’s Institute of Education Sciences (IES) for a research project entitled Digital Scaffolding for English Language Arts. The four-year research project will take place from July 1, 2015 to September 30, 2019. The project will test the effectiveness of visual-syntactic text formatting (VSTF) for improving student achievement in reading, writing, and English language arts. The study will be conducted using Chromebook computers and iPads in GGUSD intermediate schools. Seventh and eighth grade students will read for 50 minutes per week in specially-selected texts that support the California (Common Core) State Standards. English Language Arts classes will be randomly assigned to read the texts in either regular block formatting or VSTF. State and district test scores will be used to evaluate the impact of the mode of reading on student achievement. All participating teachers will receive professional development on how best to teach close reading of texts to intermediate students, with or without the extra digital scaffolding. The Principal Investigator of the grant is Mark Warschauer, Professor and Associate Dean of the School of Education at the UC Irvine and one of the world’s top scholars investigating technology and literacy. Co-Principal Investigators at UCI include Associate Professor Penelope Collins and Professor George Farkas. Co-Principal Investigator at GGUSD is Eimi Tomimatsu Garcia, Director of K-12 Educational Services. The UC Irvine School of Education is one of the top Schools of Education in the country in funded research per faculty member, with $26.8 million of funded research in the 2014-15 fiscal year. Professor Warschauer, who directs the Digital Learning Lab in the School, has received other recent grants from the National Science Foundation, the Spencer Foundation, the Haynes Foundation, and Google Research Awards for projects investigating the uses of technology to improve teaching and learning. Garden Grove Unified School District is one of the top-performing districts in the country with students from linguistically and economically diverse backgrounds. It has partnered with UC Irvine on a number of previous projects related to improving teaching and learning. GGUSD Superintendent Gabriela Mafi, Assistant Superintendent Kelly McAmis, and Director of 7-12 Instruction Lila Jenkins will provide district leadership to the project. ​Visual-syntactic text formatting, also referred to by its trademarked name of Live Ink, was developed by Walker Reading Technologies. Helping English Learners to Write: Meeting Common Core Standards, Grades 6-12 presents the tools and knowledge teachers need in order to enhance the academic writing of ELs. The five chapters include specific teaching strategies from exemplary teachers and artifacts from students at various levels of proficiency, activities, extended lessons, and suggested scaffolding techniques. Chapter 1: English Learners; Who Are They, and What Do They Need to Meet the Common Core Standards for Writing? About the Authors: Carol Booth Olson is Associate Professor in the UC Irvine School of Education and Director of the UC Irvine Writing Project. Robin Scarcella is a Professor of Academic English in the School of the Humanities and Affiliated Faculty in the School of Education. Tina Matuchniak is Director of Research for the UCI Writing Project. Olson, C.B., Scarcella, R.C., and Matuchniak, T. (2015). Helping English Learners to Write: Meeting Common Core Standards, Grades 6-12. New York: Teachers College Press; Alexandria, VA: TESOL International Association; Berkeley, CA: National Writing Project. Associate Professor Rossella Santagata spent a month as Invited Visiting Professor at the Institute Franḉais de l’Education (IFE) at the Ecole Normale Supérieure of Lyon in France, working in the context of the UNESCO Chair initiative on the “Preparation of Teachers for the 21st Century”, directed by Professor Luc Ria. In addition, Dr. Santagata spoke at the UNESCO conference on “In-School Teacher Professional Development” that was attended by the French Ministry of National Education, Postsecondary Teaching, and Research. ​Dr. Santagata 2014 keynote address was published in the French language in a book summarizing the work conducted in the context of the UNESCO Chair on the “Preparation of Teachers for the 21st Century.” In addition, an article on her NSF-funded CAREER project on the use of video for teacher preparation, entitled “Towards Ambitious Teaching: Using Video to Support Future Teachers’ Reasoning about Evidence of Student Learning” was published in a leading French journal on education research Recherche et Formation. A study of the effectiveness of embedding educational information into baby books as a way to educate mothers and fathers about typical child development, injury prevention, and optimal parenting, including coparenting. Educational books written in English and Spanish will be given to (1) mothers only, (2) fathers only, or (3) both parents. Another group will get non-educational books. With seven waves of data collection from when babies are 9 to 30 months, this project is one of the first to test differential and multiplicative effects of targeting both parents and will provide valuable insight into a low-cost and easy to implement intervention for low-income children. Feliza Ortiz-Licon, Ed.D., has been named by Governor Jerry Brown to the 11-member State Board of Education. Since 2013, Dr. Ortiz-Licon has been senior director of K-16 education for the National Council of La Raza. Prior to 2013 she was La Raza's regional director of education for California and the Far West for six years. Her previous experience includes director of policy for David Tokofsky, Los Angeles Unified School District Board of Education member, and teaching in the Long Beach Unified School District. Dr. Ortiz-Licon received her Ed.D. in 2009 from the CSU/UCI Joint Ed.D. in Educational Administration and Leadership with a specialization in urban educational leadership. Her dissertation was titled A Space of their Own: The Symbiotic Relationship between Cities and Schools. She holds a B.A. from UCLA and a master's degree from the University of California, Berkeley. Conchas, G., Gottfried, M., with Hinga, B. (2015). Inequality, power and school success: Case studies on racial disparity and opportunity in education. London: Routledge, Taylor & Francis Group. This volume highlights issues of power, inequality and resistance for African American and Latino/a students in distinct US and international contexts. Through a collection of case studies it links universal issues relating to inequality in education, such as Latino and African American males in the inner-city neighborhoods, Latina teachers and single mothers in California, undocumented youth from Mexico and El Salvador, immigrant Latino youth in Spain, and immigrant Afro-Caribbean and Indian teenagers in New York and in London. The volume explores the processes which keep students thriving academically and socially, and outlines the patterns which exist among individuals—students, teachers, parents—to resist the hegemony of the dominant class and school failure. With emphasis on racial formation theory, this volume fundamentally argues that education, despite inequality, remains the best hope of achieving the American dream. Three doctoral students from the UC Irvine School of Education have been announced as 2015 National Science Foundation Graduate Research Fellows. Gabriel Estrella, Maria (Masha) Jones, and Tarana Khan each were awarded the highly selective NSF Graduate Research Fellowship, one of the most prestigious awards available to graduate students in the United States. The fellowship provides three years of funding at $34,000 per year. These fellowships are awarded to students based on their potential for outstanding research in the field of Science, Technology, Engineering, and Mathematics (STEM) Education and Learning. A total of 16 awards in STEM were given nationally. The three given to the School of Education students represent 19% of the national total, and is more than that received in any other Department, School, or University in the U.S. in this category. 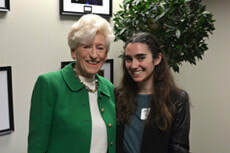 The NSF GRFP also announced Honorable Mention to School of Education students Lauren Godfrey and Doron Zinger, two of the 15 to receive this honor nationally. 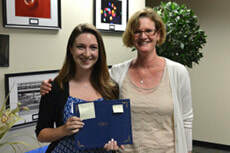 ​The NSF Awards build upon the School’s many successes. The School has advanced 57 places since its first national ranking in 2007, moving to 31st this year. Four faculty are members of the National Academy of Education. School of Education research funding reached $31 million in 2015. The School ranks in the top 2% in the number of faculty with grants. Recent grants include Professor Olson’s $11.5 million i3 grant to improve English Learner’s academic achievement and Distinguished Professor Duncan’s NIH-PO1 grant examining human capital-oriented interventions. The School ranks in the top 1% in number of faculty articles published in peer-reviewed journals, and the top 1% in number of faculty articles cited. Three faculty members are the inaugural editors of the new research journal AERA Open. 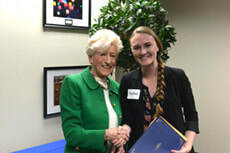 ​On April 23rd, the School of Education honored the nine Master of Arts in Teaching (MAT) teacher education students awarded scholarships in recognition of their academic achievements and service to others. 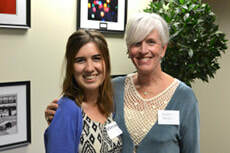 The Dean's Scholarship, presented by Dean Deborah Lowe Vandell, was awarded to Araceli Brambila and Rebecca Hicks. 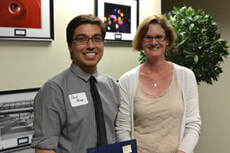 The Master of Arts in Teaching Scholarship honoring outstanding academic performance was presented by Director of Teacher Education Virginia Panish to Bethany Lockhart and David Monge. 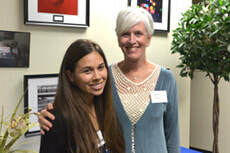 The Owen Thomas Honor Scholarship, in honor of Dr. Owen Thomas, former English Professor at UC Irvine, was presented by Dr. Panish to Brianna Breault and Kelsey Torres. ​The Teachers of Tomorrow Club (TOT) and the newly-formed UC Irvine Bilingual Teacher Student Association hosted a welcome social and panel discussion for undergraduates interested in learning more about education and about bilingual education. TOT Club Co-President Shona Bleumeneau led the panel questioning before opening the discussion to the audience. Panelists talked about the origin of their interest in education, how they confronted some of the challenges faced by educators, what they find most rewarding about the profession, and advice that they might have found helpful when they entered the classroom for the first time. The gathering closed with informal conversations among members. 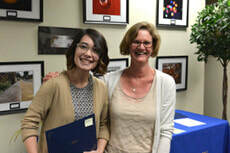 Ph.D. candidate Cathery Yeh was the recipient of UC Irvine's "Most Promising Future Faculty" award during UCI's 2015 Celebration of Teaching on May 7. The Awards are sponsored by the UC Irvine Academic Senate Council on Student Experience and the Division of Undergraduate Education (DUE). The ceremony was hosted by UCI's Teaching, Learning & Technology Center (TLTC). * For her dissertation, Ms. Yeh, who is specializing in Learning, Cognition, and Development (﻿LCD﻿), is comparing ethnographies of four teachers of color, following the teachers' experiences through their first two years in the classroom. 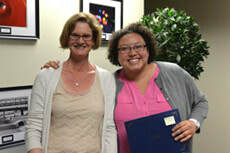 Associate Professor Penelope Collins was honored by UC Irvine for "Excellence in Undergraduate Teaching" during the 22nd Annual Celebration of Teaching Awards, held May 7 at the UCI Student Center. The Awards are sponsored by the UC Irvine Academic Senate Council on Student Experience (CSE) and the Division of Undergraduate Education (DUE). 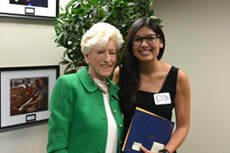 The ceremony was hosted by UCI's Teaching, Learning & Technology Center (TLTC). Dean of the School of Education, Deborah Lowe Vandell, introduced Dr. Collins. I am pleased to recognize Associate Professor Penelope Collins who is the recipient of the Celebration of Teaching Award from the School of Education. Dr. Collins is an exemplary faculty member who teaches in our undergraduate, Masters, and PhD programs. In the undergraduate program, she is a mainstay for Education 106 (Early Childhood Education), Education 128 (Exceptional Learners), and Education 173 (Cognition and Learning in Educational Settings). She also regularly supervises undergraduates in Education 193 (Independent Study in Early Childhood) in which students have supervised field placements in early childhood settings. Dr. Collins’ teaching is informed and influenced by her research that focuses on special needs children. Her classes provide our students with rich and deep coursework in understanding children at risk for learning difficulties and ways to help these children develop stronger reading and writing skills. Her concern for child welfare and positive development in young children is abundantly evident in her teaching. Her students note that Dr. Collins is particularly skilled at eliciting rich group discussions and collaborative problem solving that result in a high level of engagement in her courses. Today, Dr. Collins is also being recognized for her role in the creation of the undergraduate major in Education Sciences, the first such undergraduate major in the United States that examines education as an academic field of study. Penelope served on the steering committee that developed the major and continues as the chair of the Education Sciences steering committee. Penelope Collins is most deserving of this teaching award representing the School of Education. The School of Education congratulates Jeff Johnston on his selection as the UC Irvine 2015 Lecturer of the Year. Jeff Johnston has been an invaluable member of the School since 2000. He embodies the School’s mission to foster learning in and out of school. The range of courses he has developed spans Ethics in Education (126) to Principals and Practices of Coaching Sports (181) and Afterschool Sports and Fitness (191), a centerpiece of the School’s undergraduate Certificate in Afterschool Education. The rigor of Jeff’s courses is legendary as are the lengths to which Jeff will go to engage and inspire his students. He asks challenging questions; poses hypothetical moral dilemmas to stimulate discussion; encourages small group interactions guided by Peer Assistants to scaffold more advanced thinking; presents video case studies; and, when the topic will benefit from reaching his students on multiple levels, uses costumes and props to illustrate the importance of the subject matter. As one student noted: He is a world class professor and we learned an incredible amount (physically, emotionally, socially, academically) from his courses. Jeff’s student evaluation ratings are phenomenal – consistently near the top of the scale (6.5-6.9 out of 7; 4.85-5 out of 5) – with student comments expressing appreciation for the obvious care and consideration he devotes to course content and class culture: JJ uses every moment as a teachable moment. His enthusiasm and love for the subject matter is incredible, and he really puts all his energy into creating a great environment that is conducive for learning no matter where we are. When other faculty members attend a Jeff Johnston class, they comment that they learn something new each time. In statewide evaluations assessing alumni opinions about the quality of their education, Jeff’s graduates report being well prepared and credit his comprehensive approach to teaching: The disciplinary approaches, technology integration, and reflective practice skills have been a huge help. Shortly after joining the School of Education, Jeff partnered with LSOE Timothy Tift in developing and integrating a student and faculty support innovation – the Peer Assistant Program. Peer Assistants, students who have excelled in a course, apply to assist in a subsequent offering of the course. The experience can have a profound effect. As one PA said: This experience has been invaluable. Being a PA and getting a taste of what it would be like to teach has inspired me. spark student involvement and provide multiple channels for student feedback. While Jeff makes exemplary teaching look effortless, his skills have not come by accident, and he always is seeking improvement. He has taken advantage of the TLTC program to videotape and reflect on his teaching practices. He participates in professional Webinars, the Ethics National Convention, online research groups, sports clubs, national professional organizations, and the Open Courseware initiative. Jeff Johnston, an inspiration to all of us! I have closely observed Jeff’s teaching career at UCI since 1989, when I first hired him to teach an academic-based golf course in the Department of Physical Education. I recognized immediately that Jeff was a highly-gifted educator, someone whose dedication to teaching and learning exemplified excellence. His skills have only improved with time and since he joined the then Department of Education in 2002. Jeff engages students more than any educator I have known. He gives student ownership of their learning; he make them part of the process. Jeff assigns his students “teaching” opportunities. When they are given opportunities to “test” ways to communicate the components of a lesson, Jeff notes the effectiveness of different techniques. In addition to knowing the name of every student in his courses, Jeff also knows each student’s interests and the future direction s/he is considering. Students look forward to each Jeff Johnston class because they know that Jeff has invested the time and effort to maximize their in-class time, that he will be engaging them in the learning process, and that if they do the work, they will reap the rewards. Students know that Jeff is sincerely and genuinely concerned about their success. They want to come to class because skipping class means missing out. Jeff sets high standards and his classes are not easy. He scrutinizes every assignment, often reviewing outcomes with his TAs and Peer Assistants. If something isn’t working as well as anticipated, Jeff will adapt. He also will consult with colleagues to draw upon their experiences. Jeff teaches the way he would want to be taught – with preparation, with research grounding, with respect, and with consideration for each and every student. Jeff also engages with students in extracurricular activities and volunteers for university functions. He has served as the field site coordinator for the undergraduate Certificate in Afterschool Education program, selecting and monitoring sites for undergraduates’ field experience. He participates in the Greek system’s “Dinner with a Professor.” He volunteers at UCI sporting events and undergraduate honors ceremonies, for Commencement (carrying the torch, reading student names), and for UC Irvine’s 50th Anniversary Celebration. He supervises the afternoon sports activities for the UCI Writing Project Summer Youth Program. From 2007-2012 he led leadership seminars at Campus Recreation for ethical behavior for high school government leaders. ​Jeff Johnston’s unique skills in teaching undergraduates, his dedication to the university, and his constant striving for improvement make Jeff totally deserving of this recognition as the 2015 Outstanding Lecturer of the Year.